America's queen of television shares her fascinating life story! "Here is Betty White -- a woman who has been on television forever!" is generally how Betty White is introduced. And quite accurately, too, since she first appeared in 1949 when both she and television were rank beginners. Since then, she has had one of the most amazing careers in TV, winning five Emmy awards, creating such unforgettable characters as Sue Ann Nivens and Rose Nylund, and appearing in a host of television classics from 1952's Life with Elizabeth to The Mary Tyler Moore Show and The Golden Girls. 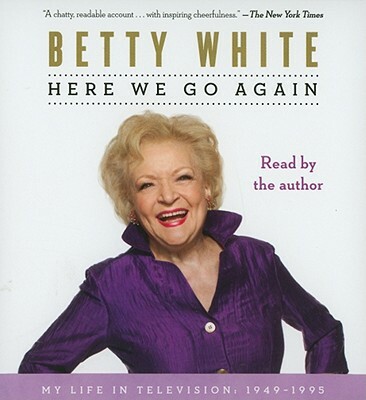 Here We Go Again gives an overview of television's golden era, packed full of wonderful anecdotes about the many famous personalities with whom Betty has worked. It also gives a fascinating behind-the-scenes look at television over five decades, from her first show, Hollywood on Television which ran live five and a half hours a day six days a week (33 hours per week! ), to Betty's current television work. In addition, she talks about her personal life -- how her hectic career caused strain in her relationships and how she finally found happiness with her third husband, the late talk show host Allen Ludden. As warm and funny as its author, Here We Go Again will thrill her many fans and delight all of those who are interested in the history of America's most popular form of entertainment. Betty White has been on television for over sixty years, beginning in 1949. She has starred in many successful series, made numerous guest appearances on game and talk shows, and narrated the Tournament of Roses Parade for twenty years and the Macy's Thanksgiving Day Parade for ten. White has received six Emmy awards and eighteen Emmy nominations. In 2010 she was presented with the Screen Actors Guild Life Achievement Award. She is also the recipient of three American Comedy Awards (including a Lifetime Achievement Award in 1990), and two Viewers for Quality Television Awards. She was inducted into the Television Hall of Fame in 1995 and has a star on the Hollywood Walk of Fame. She is the author of three previous books and lives in Los Angeles.